The two hospitals that took in the most casualties – the University Medical Center (UMC), the only Level I trauma center in the state of Nevada, and Sunrise Hospital, a Level II trauma center – as well as other area hospitals, began taking in victims. Emergency department nurses and doctors began to triage patients and get the most seriously injured treated stat (an often-used medical term meaning as fast as possible). Surgeons began operating immediately and began funneling through a seemingly never-ending line of patients. The sprint to save lives was in full swing. Longer-term treatments for PTSD (Post Traumatic Stress Disorder) and other mental issues will come next – the marathon part of the recovery process as patients recover from their wounds. 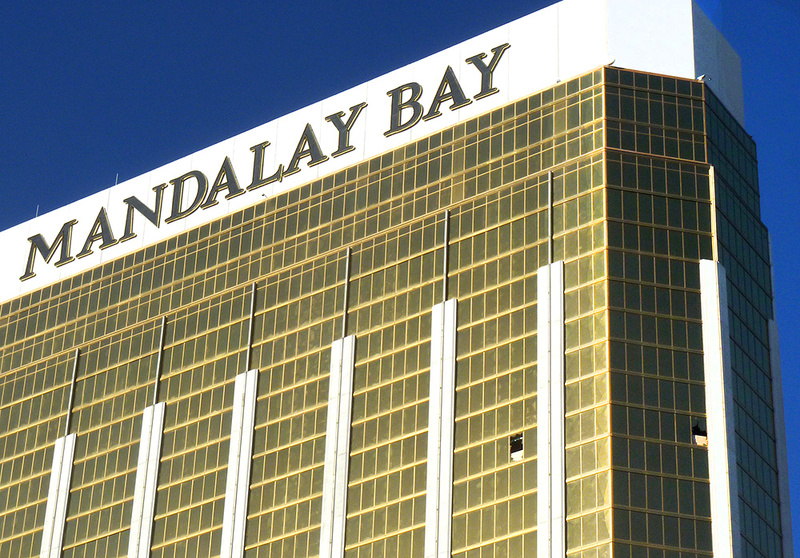 At this writing, there are 58 people dead at the hands of the gunman who fired high-powered weapons from the 32nd floor at Mandalay Bay into the penned-in crowd of concert-goers across the street, with more than 500 injured. First responders – the policemen and women, the fire fighters and EMTs, are often the unsung heroes in incidences like this. They all wear flags on their uniforms and do things to help people and save lives that often only the victims they directly help fully understand. They help someone, then move on, unknown sometimes even to those they help, let alone the public at large. 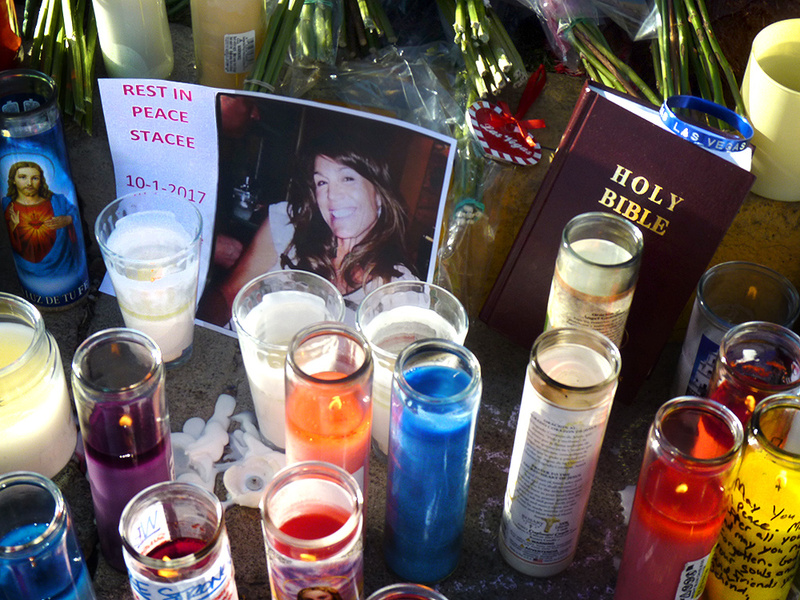 A photo of victim Stacee Etcheber, a mother and hairstylist from Marin County, Calif., sits next to a bible among candles, flowers and other sentimental mementos at a makeshift vigil area on a median strip on Las Vegas Boulevard across from the shooting site. The Level I trauma classification that UMC holds means that the hospital participates in two major disaster drills each year, in addition to internal drills. Dr. John Fildes, a trauma surgeon and UMC’s director of trauma and chair of UNLV School of Medicine surgery department, said the center has drilled on a concert venue disaster in the past. Just to get an idea of the level of dedication to getting the shooting victims treated, hospitals report that staffers ignored the traditional end of shifts and stayed on for countless hours, continuing to give medical aid; staffers who weren’t scheduled to work came in anyway to handle the volume. UMC reported treating 104 patients the night of the shooting with 4 fatalities. Sunrise Hospital reported treating 180 victims with 14 fatalities. The Valley Hospital System, which includes Desert Springs, Spring Valley, Henderson, Valley, Summerlin and Centennial Hills hospitals, released information through a spokeswoman reporting that the hospital network treated a total of 228 patients. Another nearby hospital network, St. Rose Dominican hospitals, which includes three centers, treated 57 patients. As of this writing, officials have identified all but three victims who died as a result of the shooting. Treatment of the hundreds of victims (the total of shooting victims having received treatment has been reported as 527) by the various hospitals and getting them back to health will take days, weeks and months in some cases. Steve Sisolak is the Clark County, Nevada, Commission Chair for Las Vegas, and he began an online fund-raising effort to assist the victims of the tragic Las Vegas shooting. At a news conference earlier, he noted that the fund had risen to almost $3.8 million, not counting some major six-figure contributions. He said he was very pleased with that level of donation, but that due to the nature and severity of the wounds inflicted on the victims, he anticipated needing a lot more financial help, which could then be passed along to the victims to help defray personal costs for what could be long-term treatment. The fund now stands at more than $9 million raised. If you are interested in donating, you can do so at: Las Vegas Victims’ Fund – GoFundMe.com.